This one is for my beloved Hadar, who asked last week for more meatless recipes. You know, I can be just as blinkered and blind as everyone else. Here I am priding myself on my culinary creativity and it turns out that until yesterday, I never really thought about cooking radishes. I guess because I just don’t think much about radishes. They were never my favorite vegetable growing up, even if I was taught as a little kid how to carve them into roses. Lots of people in my family loathed them–they were “too spicy” and while I liked them a little bit even when they were “hot” when I was little–I much preferred raw turnips, to radishes any day. Turnips were sweeter and crunchier, though not crisper. Radishes have such a wonderful icy, crisp texture. And, I think that texture, which was always my favorite part of radishes, was why I never thought to cook them before. If you cook them, you mess up that texture, so, why go and do THAT? But, you see, I am the only one in my house who likes radishes a lot, especially in salads. Kat won’t touch them and Zak is skeptical, though in recent months, he has been acquiescing that some radishes in a salad with a honey-mustard vinaigrette was alright, and maybe even pretty good. So, I was planning a stir-fry with tofu for Hadar’s recipe, and I looked in the fridge at my bounty from the farmer’s market on Saturday. 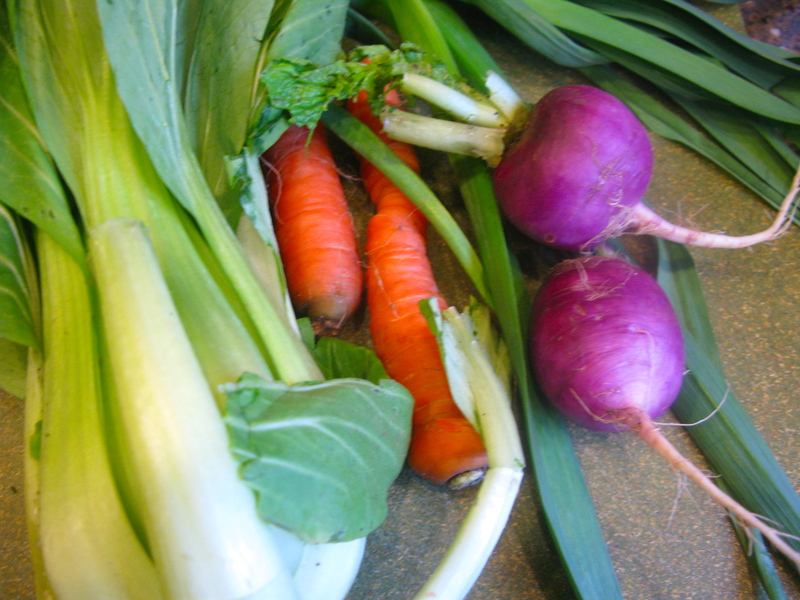 There was a beautiful bok choi from Shade River Farm, as well as some orange, yellow and purple carrots from the same lovely plot of ground. I could do bok choi and three colors of carrots, but I decided to save the purple ones for Kat to eat raw because she loves them so much. So, I kept digging in the crisper and came up with these lovely plum-colored big radishes. I think they are the variety, “Plum Purple”, which I just planted a whole packet of seeds from Seeds of Change myself. They are pretty, and crispy and crunchy, but they are a bit spicy. And I said, “Why not?” So, I sliced them into rounds, and then into half moons after giving them as scrub and a trim. I wanted that pretty rim of purple to show. Radishes are AWESOME cooked! Yes, AWESOME! (It has to be all-caps. No, really, it has to be because of my utter amazement at how tasty the wee purple buggers were once they were cooked! They lose that icy crispness that they have raw, but what they gain is sweetness. They retain their earthy sharpness, but the “heat” is ameliorated by an accentuation of the natural sugars inherent to the vegetable. You just have to be careful and put them in near the end of stir-frying so they don’t get too mushy. Slice the tofu slightly on the diagonal into thin, narrow slices. Toss with the soy sauce, wine and 5-spice powder, then sprinkle on the cornstarch and toss until well coated. Allow to marinate for at least 20 minutes while you prep your vegetables. When you are ready to cook, heat your wok on high heat until a thin ribbon of pale smoke rises from it and wafts straight up into the air. Add oil and allow it to heat undisturbed for at least thirty seconds, at which point it should ripple and shimmer in the bottom of the wok. Tilt the wok back and forth to distribute the oil along the sides of the wok. Add the tofu, and spread into a thin single-layer on the bottom of the wok. Add the white minced garlic and ginger to the wok, sprinkling it over the tofu evenly. Sprinkle the sugar over it as well, and let the tofu brown undisturbed on the bottom of the wok for at least one minute. 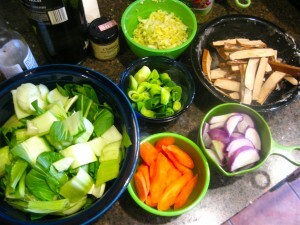 Then, begin stir-frying. After the tofu has become fragrant and the ginger and garlic has begun to stick to the sides of the wok with the tofu marinade and brown, add the soy sauce and wine, and deglaze the wok. Add the carrots and stir fry for a minute or two, then the radishes. Immediately add the bok choy and the garlic greens, then the broth or stock and cook, stirring and scraping the sides of the wok until the liquid thickens and the bok choy leaves lightly wilt and the color of the stems darkens. Sprinkle with the toasted sesame oil and sprinkle the pinch of salt over. Give it all one more toss, sprinkle with the salt, toss again, and scrape into a heated serving plate. Serve with steamed brown rice for a light, but still richly flavored and hearty meal. 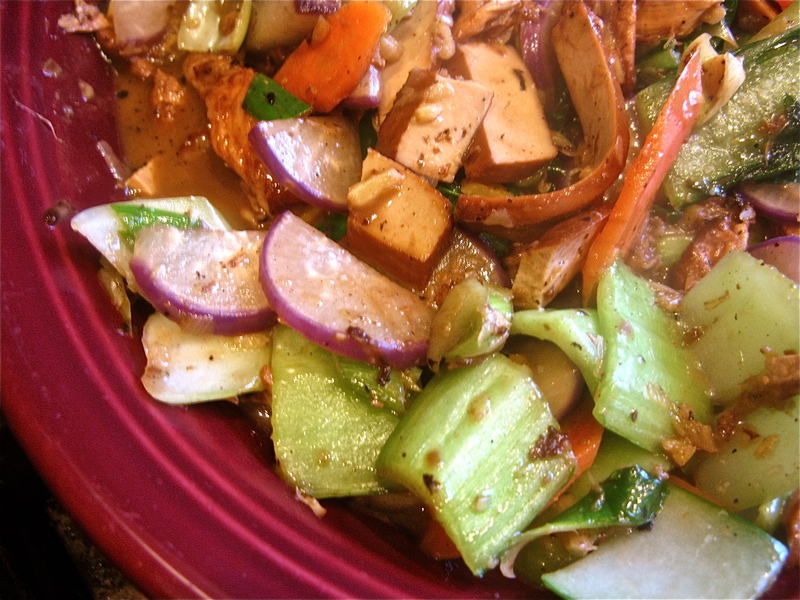 Note: I made this with all local vegetables and aromatics except for the ginger. You can substitute one clove of garlic and three scallions for the green garlic if you cannot find it at a farmer’s market near you. I rather like glazed radishes as a way of cooking radishes. Kake, they’re also very good roasted whole with olive oil and salt! I see that roasted radishes have been mentioned already. Good. When I was little, in Texas along the Mexican border, they were often also sliced and steamed as a side dish.